As the temperature drops and the snowy weather starts to drift in upon us, our winter enthusiasts are readying their gear for another season of sledding. 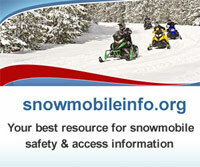 We are excited to announce the completion of new Public Service Announcements, which are designed to promote quality judgment and safe operation of snowmobiles in the coming months. We encourage all organizations to utilize these important consumer messages in an effort to spread public awareness and encourage care and caution while enjoying what is sure to be a thrilling winter season. Together we can save lives. (30 second television spot): Reminds riders that weather conditions, terrain, and impaired judgment from alcohol can endanger even the most experienced of snowmobilers. (30 second radio spot): Reminds riders that alcohol consumption lowers cognitive functions such as vision, balance and reaction time, which are imperative to the operation of a snowmobile. (30 second radio spot): Reminds riders that no matter how familiar the trail, or how thrilling the experience, excessive speed can severely reduce your control and limit your ability to react to unforeseen obstacles. 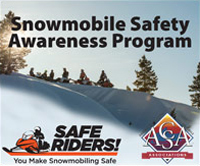 Sponsored by the American Council of Snowmobile Associations and the U.S. Department of Transportation Federal Highway Administration, these television and radio spots are available for download through the ACSA & ISMA websites.